Director Christian James (STALLED, 2013) returns to the comedy horror realm with FANGED UP. The film stars Daniel O’Reilly (Dapper Laughs, Celebrity Big Brother), Danielle Harold (EastEnders), Stu Bennett (WWE Raw), Vas Blackwood (Creep) Stephen Marcus (Lock, Stock and Two Smoking Barrels) and Steven Berkoff (Beverly Hills Cop, Clockwork Orange). BloodyFlicks - "Laughs and gore galore"
When self-styled absolute lad Jimmy Ragsdale (Daniel O’Reilly) makes a pass at his boss’ wife, the ensuing brawl seals the deal on a night he’ll never forget - locked in the halls of a hellish prison! Jimmy will have more on his plate than just tough Russian cellmate Victor (Stu Bennett), however. When the wardens unleash their true vampyric colours, the inmates find themselves caught in a bloody battle that is sure to prove just how “hard” Jimmy really is. 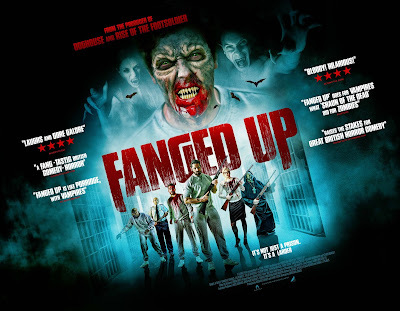 FANGED UP has been released by Altitude Film Entertainment and is out now on DVD & Digital Download.